Serving Pink Lemonade: You Can Make A Difference. You Can Help. One where there is chasing after balls, jumping into puddles, spending hours in springtime sunshine soaking up the sun? Happiness? Laughter? Giggles? Surprises? Hugs? I want that for my children. I think we all do. Today there is something we can all do to help make that miracle happen for one very special little boy. I want to introduce you to Daylon. 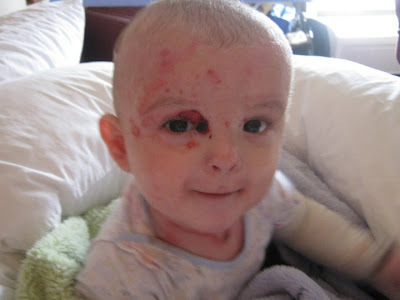 Daylon was born with Junctional Epidermolysis Bullosa Herlitz (you can learn more about it here) and was given less than 1 year to live. The only hope for this sweet little baby is a clinical trial currently taking place at the University of Minnesota. Through a combination of chemotherapy and a bone marrow transplant, doctors there hope they can save Daylon’s life. Daylon with be the first patient with Junctional Epidermolysis Bullosa (JEB) in the world to receive this treatment! He will make medical history. However, this treatment is expensive. Daylon's family cannot afford the treatment to save Daylon on their own. Jeanine and I have decided that we want to do something to help this dear family. This is why we have come to you, our faithful friends and readers. We want to hold a silent auction for Daylon right here at ServingPinkLemonade to help raise money for his treatment. The auction will take place April 27th through the 29th. Donations from you. Maybe you sew, or make jewelry, or create paper goods or mod-podged collages. Maybe you're a graphic designer and could auction a blog-makeover. Maybe you are a photographer and could donate a shoot. Or a fine-art print. Maybe you don't do/have any of those things, but maybe you have a friend who does - tell them about the auction. Ask them to donate. Maybe you feel like you could auction off a few of your children's books. Maybe you have some other gift that you feel you could donate. If nothing else, maybe you could help us spread the word. Whatever it is, e-mail us with details at servingpinklemonade@gmail.com. And don't forget to come back on the 27th for one amazing auction. If you would like to donate, please send us an auction-ready e-mail by Friday, April 23rd (or sooner!) about what you'll be auctioning off. By auction-ready, we mean a complete description of the item up for bid, a starting bid, and pictures to go along. (All donaters will be responsible to ship their donation to the winner once the auction is over. We will put you in contact with the winner.) We will upload and format the posts and the auction will be held here at ServingPinkLemonade beginning on April 27th. All bidding will be done in the comment thread of the item up for bid. We'll post more details on the day of the auction. In the meantime, please feel free to leave a comment or e-mail with questions. All payments will be made directly to an account set up especially for Daylon. 100% of the proceeds will go to the Edling family. (Cash donations can also be made at helpmakeamiracle.org). Please visit Daylon at Help Make a Miracle, and think of what you can do to help. We can't wait to see what you come up with! What a wonderful idea!! I am going home tonight and see what I can put together! What a sweet little boy! Thanks friends! This is a wonderful thing! What a great idea! I'll be stopping back by to see what is being auctioned! I know we're a little late, but my husband and I e-mailed you some items for your auction. I think this is a wonderful thing you're doing and will post a link on my Facebook and blog for the auction.